Home » Blog » What is an OCT eye examination? Most people are fairly familiar with a standard eye test – you read the lines of letters on the chart, you have a light shone in your eyes, say whether lenses make things better or worse and that’s about it, right? As technology has developed, so too has what is now possible with an eye test. Far from simply checking your sight, an eye examination can now give an accurate insight into the health of not only your eyes but the health of your whole body. An OCT eye examination is one example of this technology. The OCT scan is completely painless and non-invasive and can be carried out as part of your regular eye examination for your optometrist to review with you. What are the benefits of OCT? 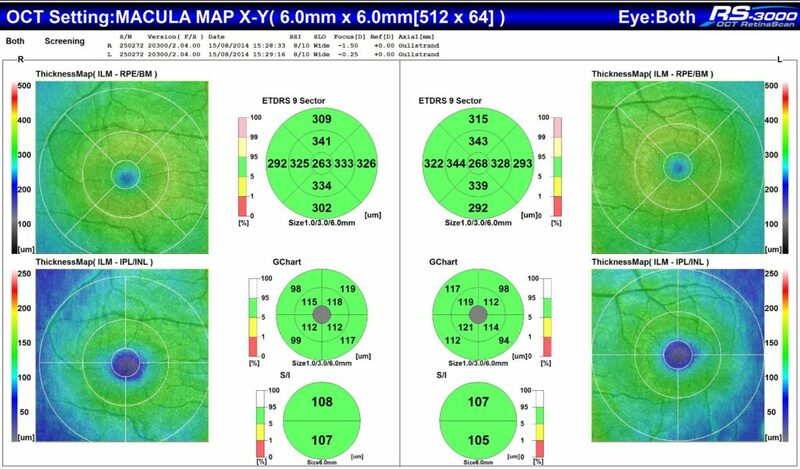 An OCT scan can help detect early signs of several eye conditions including those affecting the macula (such as Age-Related Macular Degeneration (AMD)), glaucoma and even diabetes (by detecting diabetic retinopathy). Using the detailed picture from the OCT, your optometrist can detect small changes to the health of your eye sooner, which with many sight-threatening conditions means that more of your sight can be protected. An OCT eye examination also offers a clearer picture of your long-term eye health. Your scans are stored on your records, meaning that when you next have an eye test, previous images can be looked at for comparison to help identify any changes or deterioration. 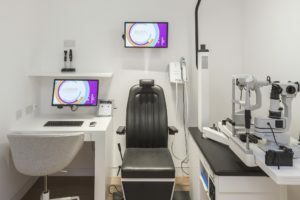 It, therefore, gives a far more complete and accurate record of the health of your eyes than can be achieved by simply looking at the surface of the retina as with traditional testing methods. What does an OCT eye examination cost? The cost of an OCT can vary between eye care providers, so do ask your optician. At Leightons Opticians & Hearing Care, an OCT scan (as part of your annual Ultimate Eye Examination) is free of charge for members of the MyLeightons Care Plan. Alternatively, it can be added to your standard eye examination for a small additional charge. If you’d like to experience an OCT scan as part of your next eye examination, contact your local Leightons branch on 0800 40 20 20 or you can book an appointment online. All pictures used are copyright Leightons Opticians & Hearing Care.